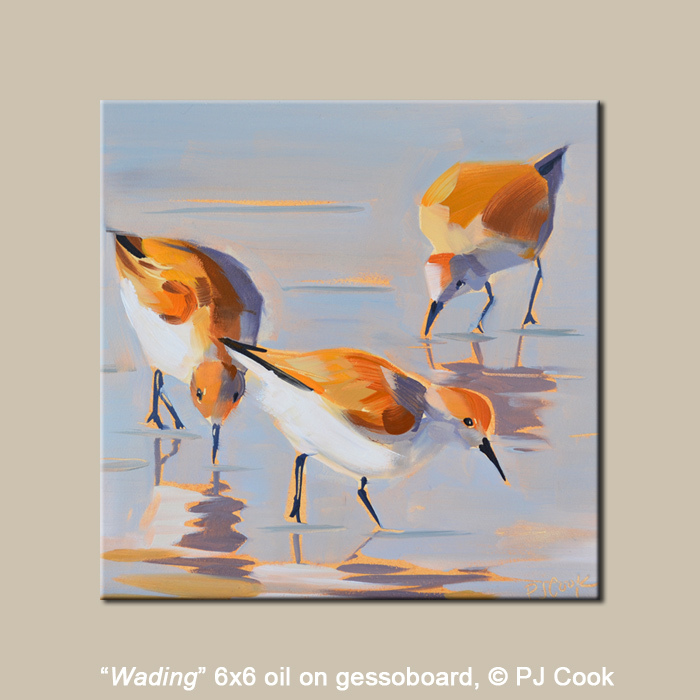 “Wading” oil painting, ©2015 PJ Cook. Wading birds is an original oil on gessoboard and is my latest bird painting. The shorebirds are wading in shallow water looking for food. Bending over with their beaks in the water and their butts in the air these 3 beach birds are so cute. This seascape was fun to paint with the trio of wading birds creating a nice colorful composition. This is an original oil painting done in alla prima style or all in one go, or wet into wet painting. A more direct application of paint is needed to control wet paint and it is much more difficult to achieve detail with wet paint.